More Americans are getting back to work. The latest Non-Farm Payrolls survey from the Bureau of Labor Statistics shows that 117,000 net new jobs were created in July, thumping analyst estimates and surprising Wall Street investors. The national Unemployment Rate slipped to 9.1 percent. 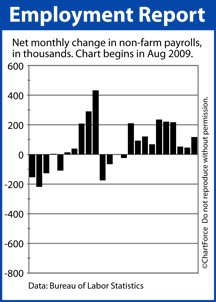 The jobs report’s strong readings would typically be a boon to stock market and a threat to mortgage rates. This is because more employed Americans means more disposable income spent on products and services; and more taxes paid to governments at the federal, state and local level. This combination fuels consumer spending and supports new job growth, a self-reinforcing cycle that spurs economic growth and often to draw investors into equities. This month, however, the market reaction has been decidedly different. Since the Friday release of the July Non-Farm Payrolls report, the Dow Jones Industrial Average has lost close to 6 percent of its value. Furthermore, mortgage bonds — which typically sink on a strong jobs figure — have thrived. High demand for mortgage-backed bonds have pushed mortgage rates below their all-time lows set last November; the biggest cause of which is Standard & Poor’s credit downgrade of U.S. government-issued debt. Ironically, the credit rating downgrade sparked a surge of safe haven bidding that has been tremendous to rate shoppers and home buyers in Nashville and nationwide. Bond buyers are flocking to the U.S. If you’ve been shopping for a mortgage, therefore, or recently bought a home, use this week’s action to your advantage. Call your lender and ask about rates. You may be surprised at what you find.